League One leaders Walsall scored twice in the last 10 minutes to secure a hard-fought victory over Peterborough. Defender Jason Demetriou met George Evans' pass to put the Saddlers ahead, his shot deflecting off Posh's Miles Addison and into the back of the net. Evans, on loan from Manchester City, then turned goalscorer as he poked home Kieron Morris' pull back. The goals came against the run of play as the visitors had been enjoying the better of the second-half exchanges. Posh's Conor Washington had his side's best chance as his point-blank header was tipped over by goalkeeper Neil Etheridge. "A clean sheet, I think that's been a massive plus for everybody. "If you look at the team, there's goals. There's quite a lot of forward players and forward-thinking players and we've not got arguably our best striker on the pitch. "I think clean sheets bring confidence, as well as helping to win games." "They dominated the first half, but we did what good sides do, we dug in, we were resilient. "We went forward with too little composure, we were too quick to play the forward pass and as a result our play was patchy. "I asked them to show much more composure in the second half, much more control over the game, and I thought they did. "We were relentless in terms of our possession for long periods, didn't take our chances and then were punished in the cruellest of ways towards the end." Match ends, Walsall 2, Peterborough United 0. Second Half ends, Walsall 2, Peterborough United 0. Romaine Sawyers (Walsall) is shown the yellow card. Goal! Walsall 2, Peterborough United 0. 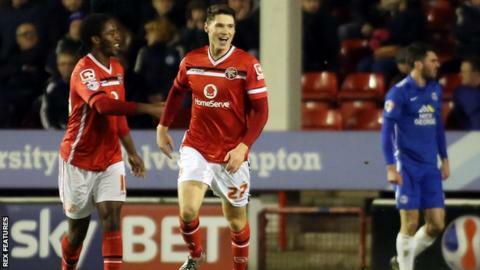 George Evans (Walsall) left footed shot from the centre of the box to the bottom left corner. Assisted by Kieron Morris. Substitution, Walsall. Kieron Morris replaces Jordan Cook. Attempt missed. Jordan Cook (Walsall) right footed shot from the centre of the box is too high. Attempt saved. Milan Lalkovic (Walsall) right footed shot from the left side of the box is saved in the top centre of the goal. Delay in match Neil Etheridge (Walsall) because of an injury. Conor Washington (Peterborough United) is shown the yellow card for a bad foul. Substitution, Peterborough United. Erhun Oztumer replaces Harry Beautyman. Goal! Walsall 1, Peterborough United 0. Jason Demetriou (Walsall) right footed shot from the right side of the box to the bottom left corner. Assisted by Anthony Forde. Substitution, Peterborough United. Souleymane Coulibaly replaces Lee Angol. Substitution, Walsall. Anthony Forde replaces Sam Mantom. Attempt missed. Lee Angol (Peterborough United) left footed shot from outside the box is too high. Foul by George Evans (Walsall). Attempt missed. Sam Mantom (Walsall) left footed shot from outside the box is close, but misses to the left. Corner, Peterborough United. Conceded by Andy Taylor. Corner, Peterborough United. Conceded by Neil Etheridge. Matt Preston (Walsall) wins a free kick on the right wing. Attempt missed. Miles Addison (Peterborough United) header from the centre of the box is too high.